During your initial interview with your New Jersey DWI lawyer, you will have to provide important information about the events that occurred before, during, and after your DWI arrest so that your DWI lawyer can start preparing for your defense in your DWI case. Your lawyer will also provide you with some information: he will educate you about the nature of the charges against you, what kind of penalties you’ll face if you’re convicted, and what your chances of acquittal are. First, you should provide your lawyer with a detailed chronology of what happened the night of your DWI arrest. Begin with everything that happened several hours before your arrest, and end your account with your release from police custody. Include what you ate or drank before your arrest, as well as the type and quantity of alcoholic beverages you consumed and over what period of time. (3) If you are found guilty, your DWI lawyer will have to question the validity of your prior DWI convictions, which can serve as a basis for a mandatory jail sentence. 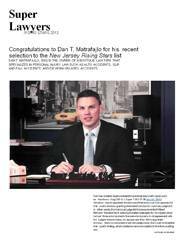 If you’ve been charged with a DWI, New Jersey DWI lawyer Dan T. Matrafajlo can help you. He has extensive experience successfully handling DWI cases and will thoroughly research the facts of your case to come up with the best possible defense. Simply fill out the form on this page for a free initial consultation.